The new streamlined Apple TV v2 box launched in the UK in October 2010. With this box, you can stream films, music, photos and more over a home Broadband connection onto your TV set. With Apple TV, you can watch video from iTunes, rent movies and get your iTunes content from your PC or Mac onto your telly. Setting up the Apple TV box is simple. All you need to set it up is an HDMI cable, an Internet connection (wireless or wired) and an HD Ready Television. 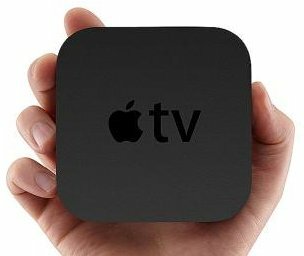 What does Apple TV offer? Rent films, ad-free and in HD. 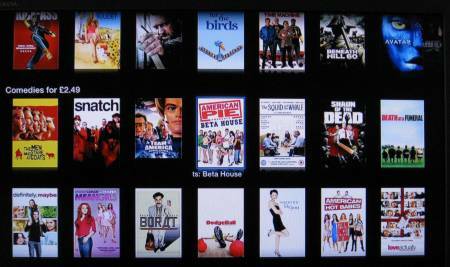 The Apple TV box gives you access to movies, TV programmes, photos and more. It doesn’t have its own storage space like the first generation box, which means everything is streamed – no more managing storage or syncing to your iTunes library. Apple TV hooks up to your TV using HDMI and to your router (via cable or wi-fi). It supports HD film rentals over the net, plus music, photos and TV shows streamed from your computer. Just like watching a DVD, you can fast-forward, rewind and pause. Listen to the show online, or download it to your MP3 player. Q. "Does Apple TV receive Freeview HD?" No, it doesn’t. Apple TV does not include a Freeview receiver, either for standard or HD Freeview. Got a question about Apple TV? Please ask us – we’re happy to help! I have an app on my iPad for Film on Live. Would it be possible to have the same one on my tv through my apple adaptor? Thank you. regard to all the team.